Yesterday, I showed you my “grab-and-go” embroidery project, a little Spring design for the corner of a towel that I’m going to use as a basket liner. Here’s the embroidery pattern for that piece. This embroidery design comes from a stack of hand embroidery transfers that I got at a garage sale. It was pretty old, and just a straight design, not a corner design. The original was a mess, so I scanned it and worked from the scanned image, cleaning it up into a vectorized image, which I’ve saved as a gif file (you can click on it to make it larger, then save it to your computer and resize it if you wish), and also as a PDF file, which you can also resize and print. Of course, you are more than welcomed to use any colors you want! fishbone stitch, on the leaves, except for the largest open one, which is outlined in stem stitch – and the stems, which are worked in stem stitch. The center of the flowers are worked in buttonhole wheels, then filled with French knots. You can see these up close on the introduction to this little project. I also used chain stitch quite a bit, and some bullion knots and pistil stitch, daisy stitch, running stitch, backstitch and fly stitch. For a flour sack towel, I suggest using a better quality one, if you can find one. Some of the flour sack towels out there are very flimsy and seem almost like cheesecloth. I like the deluxe flour sack towels from American Chair Store. this i looking really cute, im glad you went with the bright coloras. love bright colors too< just haent had a project to use them in. i cant wait for you to work moreon this, i might folow along with. i wanted o know how many thread did you use? im thinking you used two? am i right? What a nice design! Thx for sharing! Glad you like the design! Lisa, you’ll have to let me know how it goes! Yes, Jules – you are correct! 2 threads…. I just tried one area with one thread, but it didn’t look so good, so I picked it out and went back to two! Thanks…another great design. I ended up with some of those cheesecloth towels – useful in the kitchen, but impossible to stitch. Anybody got a good source for better towels? Here’s the best gift I’ve ever gotten: I had been whining to my mother about hating to cook, and how much I dreaded making supper for 3 teenage boys and an athletic husband each night. The sheer quantity is daunting, my kitchen tiny, their schedules erratic, etc. I learned from my grandmother that when you don’t know what to make for supper, start by chopping up an onion and simmer it in a skillet with a little oil. While it’s simmering, then you rummage in your pantry, the cooking onion will be your inspiration, and a welcome reassurance to your family that supper’s coming and it’s gonna be good…. Still whining, I told her about how much my eyes are bothered by chopping up onions (better now that I sharpen my knife to perfection before I begin). The next time my mother came to visit, she brought a huge freezer bag of onions she had chopped herself. Inside the freezer bag were little zipper bags of chopped onion, in 1/2-cup and 1-cup aliquots, all labelled and ready to freeze. I hugged her and hugged her, and you guessed it *cried*. For months, I wept every time I reached into the freezer to start cooking for my family. What love went into that gift! thoughtfulness, ingenuity…. Since then, I’ve noticed bags of chopped onions with the frozen vegetables, and even bought one once, but they were really large chunks, and my mother used better onions, it just couldn’t compare. That’s my Gold Standard for giving….. Thank you, I look forward to reading you every morning. Wow, it’s beautiful! I’ll be linking to this if you don’t mind. I am totally amazed an impressed that the pp does 60 towels a year-wow! ce motif m’inspire ! merci beaucoup ! votre site est vraiment magnifique et c’est un réel plaisir d’y venir ! The comment from WendyBee really seemed to touch my heart and made me think of my mother who is gone and suddenly I began to bawl like a baby missing her so much. I wasn’t the greatest daughter and regret not appreciating her while she was here. She did her best. Sorry – didn’t mean to rattle on. I love your embroidery site and wanted to let you know you are the greatest!! Mary, this was exactly was I was looking for to add more punch to a project that just had embroidered words. Thanks so much! This is beautiful! Okay, so this was a link in your 2017 Easter newsletter, and that is why I am commenting on an 8-year-old post. Ahem. Why, oh why!, did no one ask about the adorable bunny? I went through all of the comments and no bunny mention! What?! This is the INTERNET. Nothing (well…) gets more attention than adorable little furry guys! 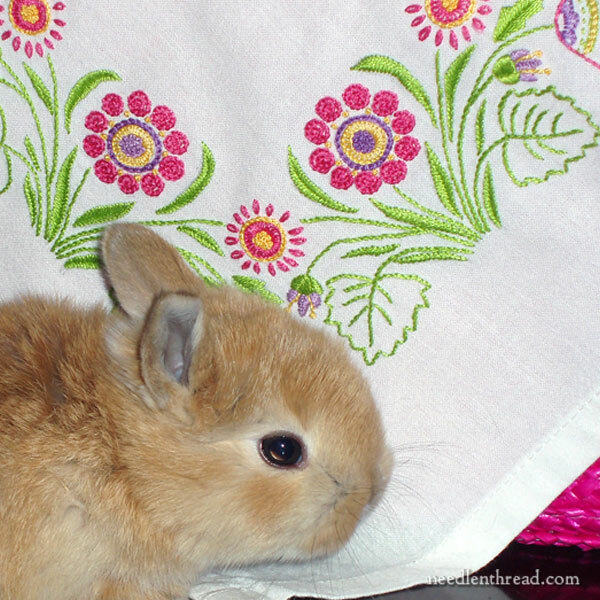 AND you got a bunny to appear in a picture with your Easter-y embroidery around Easter-time. Did you have to pay for the use of bunny? Is it a rich and famous bunny doing some charity work and said, “Yeah, sure! I’ll take a picture!”? Oh, it doesn’t matter. The embroidery is lovely and looks like fun, I might actually stitch up this pattern. And the little guy in the picture is sooooo sweet. Bunny made my day. And, because I have the annoying habit of naming things that I have no business naming (other people’s newborns…), I’m naming it Dave. That bunny is a solid Dave. 🙂 We had a whole family of new bunnies that year! Next Next post: Happy Birthday to Me Give-Away!